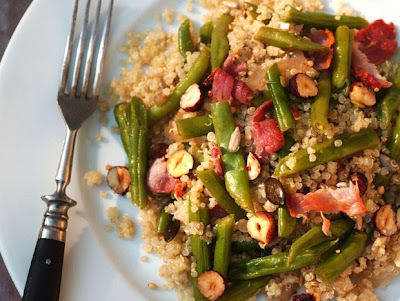 When I came across a recipe of green beans with bacon and hazelnuts some time ago, it was declared a side dish. Some grains and seeds would serve just right to make it a complete and filling meal. 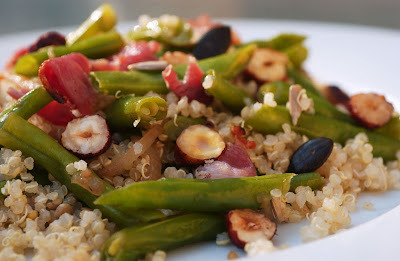 I chose quinoa, but it would work as well with bulgur or brown rice. I love the smoky flavor of the bacon together with the beans and the slightly lemon-scented grains just round up the taste of the whole dish with some freshness. Place quinoa with water and salt into a bowl and cook covered and over medium low heat until all liquid has been absorbed. Transfer to serving bowl. Mix oil and lemon juice in a bowl and pour over the cooked quinoa. Stir in the seeds. Add the green bean mixture and toss. Serve hot or at room temperature.